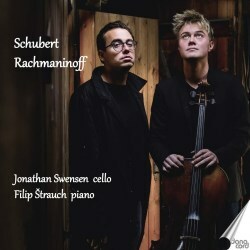 Danish-American cellist Jonathan Swensen and Slovakian pianist Filip Štrauch recorded these works while studying at The Royal Danish Academy of Music in Copenhagen. This is rather more than a graduation exercise, though. Both artists were prize-winners, had been performing the pieces in public, and have now established themselves as professional performers. Danacord has done well to capture them at this early career-stage in two of the standard works for the cello and piano repertory. The long gestation period of study and preparation for a recording over a two-year period is very unusual, and brings benefits in terms of the joint consideration of interpretative detail, and does not seem to militate against a sense of spontaneity. The Schubert was of course not written for cello, but for an arpeggione, a recently invented bowed guitar which never established itself, so that the piece is now played on the cello (or viola). If it has not the depth of other works of 1824 from Schubert, its charms are not negligible. In the first movement, this duo brings to it a homely quality that suits its domestic manners, and listen to each other in true chamber music fashion. Filip Štrauch is very sensitive to the harmonic sleight of hand in the sixth bar of his part, as well as in much of what follows. Swensen’s cello sounds sweet-toned, and his phrasing is natural and persuasive. He is accurate too in those passages at top of the instrument (the arpeggione went higher than the cello). The Adagio is soulfully played, so that it becomes rather more than a mere prelude to the finale, into which it leads directly. This closing Allegretto has the least substantial music, but it is quite agreeable enough in such sympathetic hands. The Rachmaninov Cello Sonata has two features often remarked upon by commentators. First, there is a kinship with the contemporaneous Piano Concerto No.2, and second the piano part is virtuosic and at times dominant. Neither is exactly a problem, since the concerto is one of his most popular scores and Rachmaninov actually called his work ‘sonata for piano and cello’ with the instruments in that order. Despite that, it is possible to exaggerate the piano’s dominance, since every cellist wants to play this work as it gives the instrument so much glorious, and especially lyrical, music. It was Swensen’s suggestion that they learn this piece, as he writes in the booklet note, and he revels in the melodic gems in his part, especially in the Adagio and right up to the magnificent second subject of the finale (a real ear-worm if you don’t know the work). Štrauch and Swensen adopt steady tempi in the Scherzo and the main theme of the finale, accurate enough, although other versions generate more electricity in these passages. For the most part however this is an excellent account of a superb work. Other recommendable versions of both works are numerous of course, but almost always with other couplings, such as more Schubert chamber music in the case of the ‘Arpeggione', or the Chopin Cello Sonata, or other Russian pieces in the case of the Rachmaninov. This pairing is surprisingly rare. The only direct competition I can find is that from Alexander Debrus and Alexander Mogilevsky, who add Rachmaninov’s Vocalise, (Pavane 2011), but which I have not heard. So if the coupling appeals, you will find very good performances of both works on this Danacord issue. There is a slender booklet note with nothing at all about the music, and good well-balanced sound.